Abstract_Atheist’s supposed refutation was to say that, for example, the noumenal realm is either yellow or non-yellow. If it is yellow, then one of our concepts applies to it, (“yellow.”) If it is not yellow, then one of our concepts still applies to it, (“non-yellow.”) In either case, a human concept applies to it, thus (supposedly) negating the noumenal realm’s defining status as outside human cognition. /u/drunkentune has a point. Non-axiomatic concepts are contextual and can’t generally be said to divide all of existence between themselves and their antitheses. I make this point in my discussion of fairness and justice. 2. An existent is itself. This last axiom directly eliminates any distinction between a “noumenal” and “phenomenal” realm. I discussed this with /u/ReallyNicole in a thread, here. Also, as a side-note, have you listened to or read Understanding Objectivism and/or Objectivism Through Induction? This last axiom directly eliminates any distinction between a “noumenal” and “phenomenal” realm. There doesn’t seem to be any proposed elimination of this distinction in what you say. Your refutation does not even mention the terms “noumena” and “phenomena”, let alone any of Kant’s arguments for this distinction, let alone a refutation of these arguments. 1. My consciousness perceives existence. 2. My consciousness perceives some thing, X, that is part of existence. 3. What is the “X-in-itself”? The X that I do not perceive? 4. But I already said that I perceive X. And so the basic metaphysical distinction of the Great Circumlocutor collapses. If you want another angle on it that provides a little more detail on how people get confused, feel free to click on the link to my discussion with /u/ReallyNicole, above. Again, you have not even mentioned the distinction in your supposed refutation. There is not even the barest appearance of a refutation offered here, since you would at least have to reference the things being refuted to give even the barest appearance of a refutation. What’s confusing me is you saying nothing at all about the phenomena/noumena distinction, and then asserting with a triumphant non sequitur that you’ve refuted it. 1. I perceive some thing, X. 2. The notion of the thing-in-itself entails that I do not perceive X. 3. But it’s not true that I do not perceive X (by 1, PNC), therefore the notion of the thing-in-itself entails a falsehood and we should reject it (by RAA). Of course, (2) is false. So that supposed refutation isn’t going to work. Yes, that’s accurate. I thought it was obvious enough not to need that sort of formalizing. If “thing-in-itself” is meaningful and distinct from what I directly perceive, then it needs a definition. Could you define “thing-in-itself” and distinguish it from the things that I perceive? I’m not sure how to reconcile this idea that you didn’t state your refutation because you thought it was too obvious to be worth the trouble, with the trouble you did take to write a longer bullet point list than was needed to state the supposed refutation, but which left the supposed refutation obscure. In any case, if this is your intended refutation, then it fails, since the notion of the thing-in-itself does not entail that we do not perceive the things that we perceive. Kant nowhere rejects but rather defends the idea that we perceive the things we perceive, i.e. appearances. He denies that we perceive things-in-themselves, but there is no contradiction here, since appearances and things-in-themselves are not identical, as the nature of appearances is determined by the nature of our capacity to perceive (i.e. the form of our sensibility) whereas this is precisely not true of the thing-in-itself. I can, but in this context I shouldn’t have to. Your allegation was that you have a refutation of Kant’s position, indeed a “real quick and easy” one. If it turns out that you don’t know what Kant’s position is, then this allegation was nothing but empty bravado. You have charged that Kant’s notion of the thing-in-itself is incoherent since it claims that we can’t perceive the thing we perceive. But this charge is a straw man, since Kant nowhere claims anything of the sort. Do you have anything further to say in defense of this charge? That is: a thing that is perceived by humans through a human means, but is not, itself, perceived by humans. That is: the object of the process of human sensory perception that is not, itself, the object of the process of human sensory perception. There is no transformation of the “thing-in-itself”, which always designates an object regarded as it is independently of our forms of cognition (sensibility and understanding). What I presume you’re proposing is that we regard the object which affects our sensibility so as to produce appearances as being a thing-in-itself. It is “perceived” in the sense of being that which affects our sensibility. And it is not “perceived” if we take this term as referring to the state which is apprehended as appearance. By introducing the same term to refer to these two different ideas, you introduce the equivocation which allows you to feign that there’s a contradiction. But there is no contradiction here when we repair your equivocation: there is no contradiction in saying that that which affects sensibility is not the state which is apprehended as appearances. Your charge is a fallacy of equivocation, and accordingly offers no substantial objection to Kant’s position. …if we take this term as referring to the state which is apprehended as appearance. We don’t apprehend “states,” apart from objects, in extrospection. (What is it a state of? A state of some sort of things.) We apprehend objects or things (the state and actions of extramental entities, if you like) by means of the process of perception. The light traveling from a source to an object, from the object to my eye, being absorbed by my retina, the resultant excitation being processed by my optic nerve and brain, are all a part of the overall process of perception. These sub-processes determine the form in which I perceive extramental things; (how I perceive them.) The objects of that process are the extramental things that emit and reflect the light. No one has proposed anything about apprehending states apart from objects, although since you’ve raised the point, this does in fact happen: for example, in dreams, hallucinations, optical illusions, and so forth. And if the square quotes around the word ‘states’ is meant to suggest that you prefer some other word to refer to perceptual states, you’re welcome to your preferred terminology, so long as equivocations you introduce with your terminology are not used fallaciously, as they were in the supposed refutation of your previous comment. If what you mean to say here is that perceptual states are, in principle, numerically identical to the objects which affect us to produce those perceptual states, this is obviously not true, as is evident from the many well-known demonstrations of the differences between perceptual states and their intentional objects: for example, the appearance of a bent stick that results from looking at a straight stick put half-way in water, objects taking on different colors under different lights, again various optical illusions, the feeling of pain one locates in one’s extremities following injury to one’s central nervous system, and, more systematically, the entire sensory fields of the so-called “secondary properties” (of color, scent, taste, and so forth), which we are told do not belong in the external world regarded in itself and yet which we situate there in our perceptual understanding. This is just the commonsensical approach to the issue. Furthermore, but rather significantly on point, Kant gives a series of arguments in defense of this distinction in the “transcendental aesthetic” and “transcendental analytic”, which you have conspicuously failed to so much as vaguely reference by implication, let alone refute. The reader looking for substantiation of your claim to have refuted Kant–refuted him really quickly and easily, you boasted–would naturally inspect your comments for refutations of these arguments; but, so far, entirely in vain. I understand that this is the thesis you wish to assert against Kant’s position, however the argument you have provided against Kant on this point was a fallacy of equivocation and you’ve yet to so much as mention the arguments of Kant’s which you purport to have refuted. We don’t apprehend “states,” apart from objects, in extrospection. Dreams and hallucinations are forms of introspection. They are produced from memories of sensory information. Optical illusions are extrospective, and so are a form of perceiving some object. I cannot actually see the seemingly bent pencil in water apart from the pencil and the water. I see the whole physical situation by means of the light travelling to my eye. But for me to actually see this scene, the objects must be present, and their actual properties are involved in making them look the way they do. In regard to perception and the “thing-in-itself”: Perception is the receipt of information about an external object by a mind. The whole process of the transfer of that information is the process of perception. There is no other sense in which I’m using “perception,” so there’s no equivocation. His argument, in essence, ran as follows: man is limited to a consciousness of a specific nature, which perceives by specific means and no others, therefore, his consciousness is not valid; man is blind, because he has eyes—deaf, because he has ears—deluded, because he has a mind—and the things he perceives do not exist, because he perceives them. If you keep these points in mind when reading any of Ayn Rand’s other comments about Kant, you should see that she’s quite accurate about him when you strip away all of his extra verbiage and obfuscation and focus on the essentials of his system. …the entire sensory fields of the so-called “secondary properties” (of color, scent, taste, and so forth), which we are told do not belong in the external world regarded in itself and yet which we situate there in our perceptual understanding. For more on this, I refer you to David Kelley’s The Evidence of the Senses. /u/wokeupabug responded to my last comment, but it’s a weak response that does not even attempt to comprehend what I refer to as perception. All it does is repeat the same misconceptions and attempt to obfuscate the essential issue at hand with Kant’s rationalizations. You can read it if you like here. /u/wokeupabug responded to my last comment, but it’s a weak response that does not even attempt to comprehend what I refer to as perception. All it does is repeat the same misconceptions and attempt to obfuscate the essential issue at hand with Kant’s rationalizations. You can read it if you like. That doesn’t seem very charitable at all, and after reading through it, he seems to be quite comprehensively addressing what you were saying. Perhaps you could explain in what ways he isn’t addressing it? What misconceptions do you mean? And what obfuscation do you have in mind? Optical illusions are extrospective, and so are a form of perceiving some object. I cannot actually see the seemingly bent pencil in water apart from the pencil and the water. I see the whole physical situation by means of the light travelling to my eye. But for me to actually see this scene, the objects must be present, and their actual properties are involved in making them look the way they do. Rather than taking a step back and saying, “Huh, that’s an interesting view of what perception is. Let me investigate this further by asking /u/Sword_of_Apollo to clarify, or reading the free online book, The Evidence of the Senses by David Kelley,” /u/wokeupabug persisted in taking representationalism for granted and reasserted that there is “a meaningful difference between the state made immediately present to us in conscious awareness and the external object…”. As a professional in philosophy, /u/wokeupabug should know better than to take representationalism for granted, and doing so obfuscates the issue of perception. Let me be as clear and explicit as I can about this: I reject representationalism of any sort, including when it goes by the name of “Sense-Data Theory.” The immediate object of our conscious awareness is the object out there, in its full physical context. I deny that I am a “homunculus” within myself watching “sense data”; I am I. And I consider it nonsensical to say, in any sense, that I am literally perceiving my own perceptions. I am perceiving external objects in their physical situation; that is, information about (from) those objects is being transmitted to my mind. Consider an analogy for the process of perception: A piece of denim goes through a factory process that makes it into a pair of jeans. The object of the process is this piece of denim; it is the thing on which the process works–the input. It is analogous to the physical object being perceived. The process that turns the denim into jeans is analogous to the process of light reflection, retinal absorption, brain processing, etc. The freshly-made pair of jeans is analogous to my awareness of the object of perception (the piece of denim.) The pair of jeans in storage is analogous to my memory of seeing the denim. “That pencil in water is bent,” is a conceptual misidentification of a wordless, stereoscopic view on the world (perception) that is self-evidently and immediately given to you. What we call “optical illusions” are simply perceptions of external things that we consider unusual or difficult to interpret, conceptually. This entry was posted in Epistemology, Metaphysics and tagged Ayn Rand, categories, faith, Immanuel Kant, Kant, mind, Objectivism, philosophy, reason, truth by Sword of Apollo. Bookmark the permalink. When you get the percept of a red apple, does it mean that a red apple exists? It’s interesting re. Kant. The major tradition of interpretation (which Rand obviously followed – main contemporary representative being Paul Guyer) has him as an Idealist, but since he denied that he was an Idealist many times, there’s a minority interpretation of him (main representative being Henry Allinson) that tries to take him seriously in that denial, and emphasizes that he was an Empirical Realist, and that the “Transcendental Idealism” that pairs with that, refers simple to questions about God, the world as a whole, etc. (those are the things that have a purely ideal, not an empirical, interpretation). Under this alternative interpretation of him, the “thing in itself” is actually more comparable to the Objectivist notion of “intrinsic”, and the things we experience are real objects, independent of us, nothing is hidden from us, it’s just that we can only conceive of objects insofar as they may be objects of possible experience (i.e. in conceptual terms that are drawn from experience, and in terms of what’s necessary for experience to be possible). Re. the noumenal, that term refers to things conceived in an “intrinsic” sense with a direct faculty of knowing similar to God’s – that’s what he was denying we have access to. The key would be that what “awoke him from his slumbers” re. Hume was that he realized the whole idea of “representation” as that had hitherto been put forward in the tradition from Descartes, to Berkeley and Locke and Leibniz and Hume, that Kant had worked in up to that point, in terms of which we perceive only perceptions, experience only experiences, was wrong. This would mean, in essence, that he’s actually more like Thomas Reid (with Reid’s “common sense” being akin to the inbuilt Categories), and ironically enough, also a bit like Objectivism (with both of these being akin to the Axioms). IOW, when he called his system Empirical Realism, he meant precisely that the Real is what we encounter in experience, not something intrinsic “behind” what we experience in any way, and in this he was going AGAINST the tradition that takes “experience” to refer to an interposed medium, the representation, that’s the only thing we’re immediately aware of. So in this interpretation, the confusion re. his writing arises because he’s using jargon from the tradition he’s “awakened” from, to critique it (and from the older, scholastic traditions at the same time, which he’s also criticizing). Hence it’s possible to sort of “oscillate” in one’s reading of him – sometimes you can indeed read him as if he were an Idealist, but if you key into him not being a Cartesian (i.e. that being the tradition he’s trying to get away from) then those same passages can look quite Objectivist, just in a confusing jargon. That said, while if this interpretation were true he’s one of the most misunderstood philosophers in history, it’s still true that he did have a belief in God and wanted to “deny reason” to make room for “faith” re. God, and it’s still true that how this affected his altruistic moral philosophy did tremendous harm, and it’s still unfortunately true that the Idealist interpretation of him (what many subsequent philosophers THOUGHT he was saying, and used his authority to bolster) re. epistemology, even though it’s a faux philosophy that he didn’t mean, has done tremendous harm. 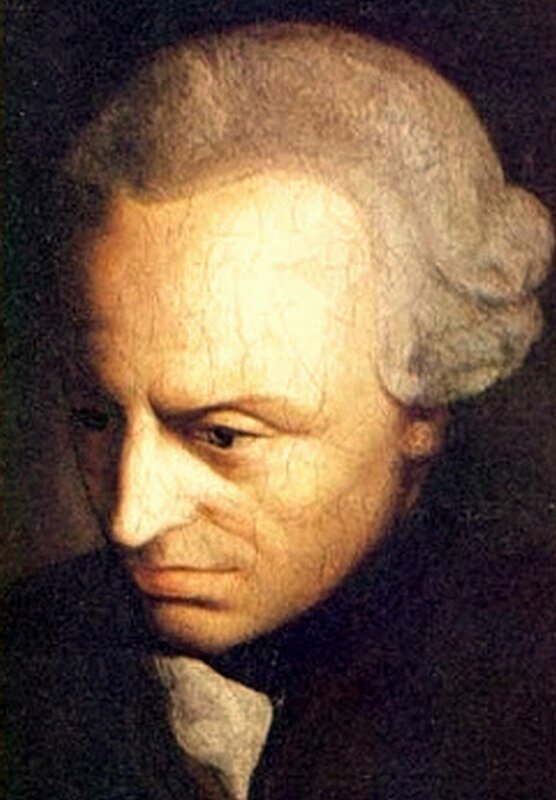 Who is criticizing Kant ? I want his contact, he was perfect on debunking it.